Dear Readers, meet Bonnie & Clyde. These were not the names given to them by the shelter. 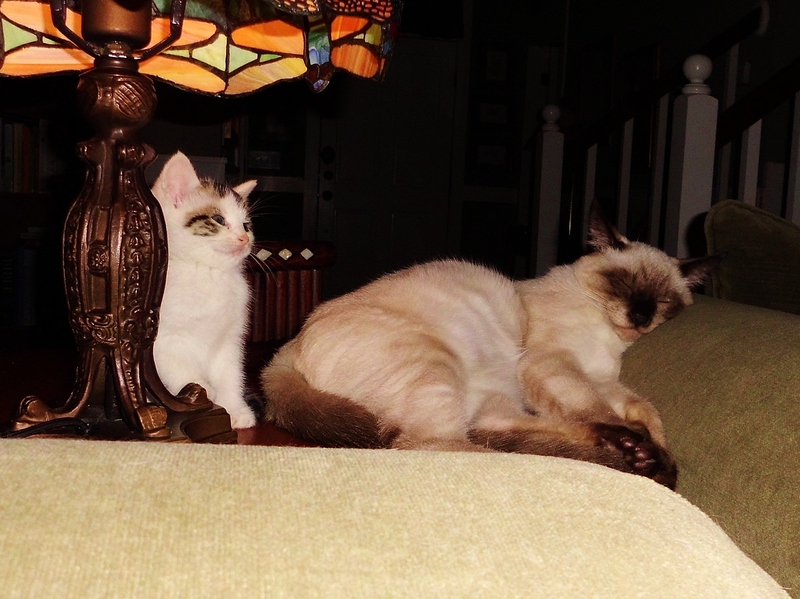 The mostly white kitten was named “Alley”. No way I could call her that. The bandit-faced one was named “Mallory”–problematic since she is a “he”. Jim was able to distinguish the sexes of each kitten. He’s gotten to be an expert on this subject; a talent he finds quite useful on our kitten farm. It was Jim, too who suggested the names. Their story is not as dramatic as our previous little storm drain survivor. Bonnie & Clyde’s tale is all too familiar to the good people at the Montgomery Humane Shelter. 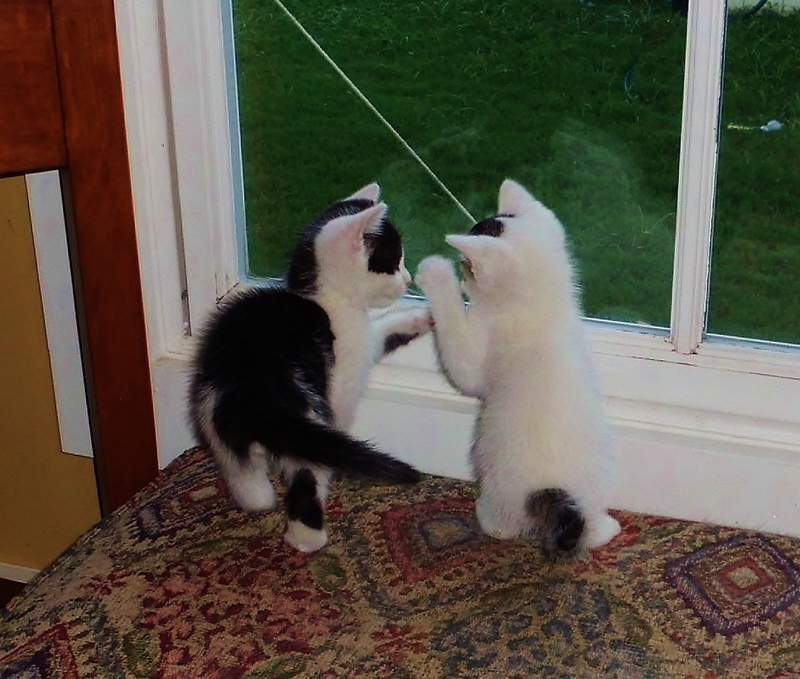 They were brought in by someone who had many feral cats living around his home. He considered himself a great humanitarian because he occasionally put out some food and water for the little varmints. He chose these two to bring in to the shelter because they were “hissy”. Hmmmmmmmmmmmmm. Mulder is perplexed by these two little trouble-makers. 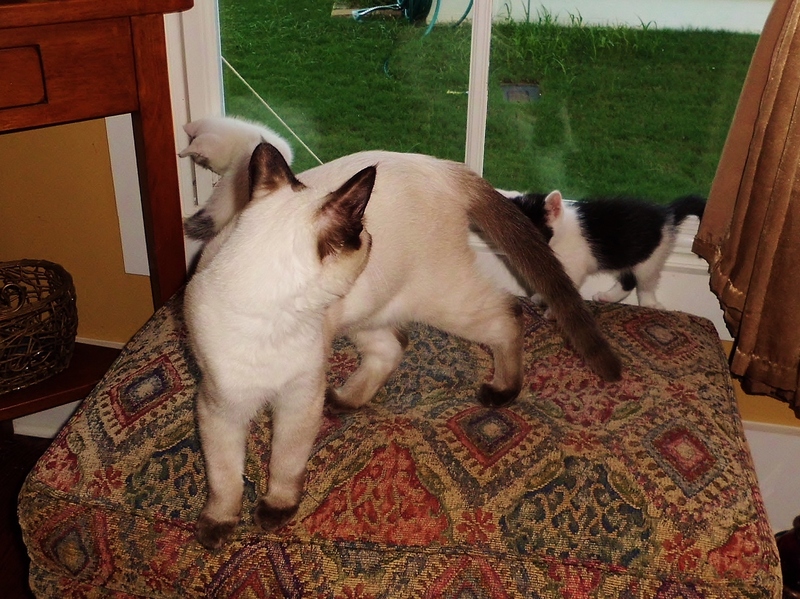 They have not fallen at his feet and declared their love and devotion to him as my previous foster kittens have done. They are seriously bonded to each other, and while they think Mr. M. is a fine gentleman, they don’t give a fig if he pays attention to them or not. They quickly displaced him from his bird-watching post. Move over old man, we’re the new gang! 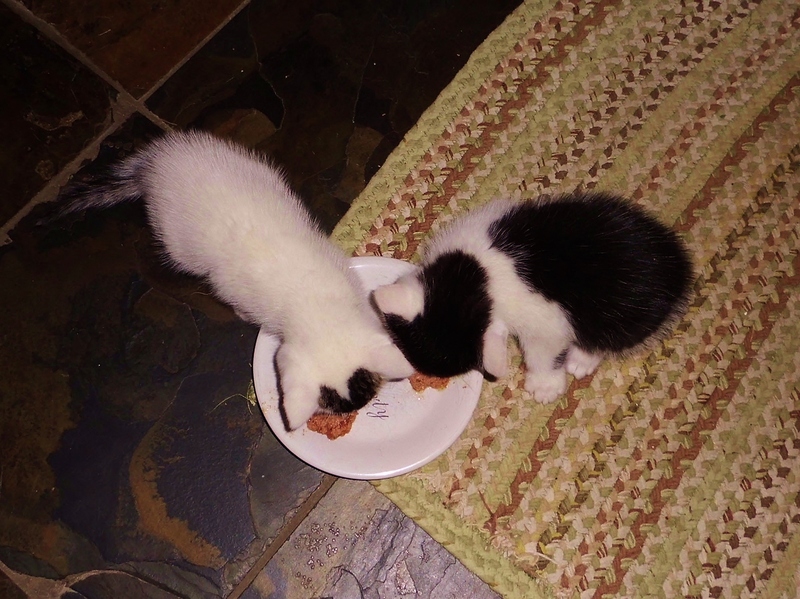 Neither kitten was skinny, and they seemed in good health despite their less than optimal beginnings. They quickly showed a love of toys, soft cubby holes, and delicious moist kat fud. When my young friend Meggie heard about our new house guests, she came to visit and bestow gushy baby talk on the cute little fluff balls. 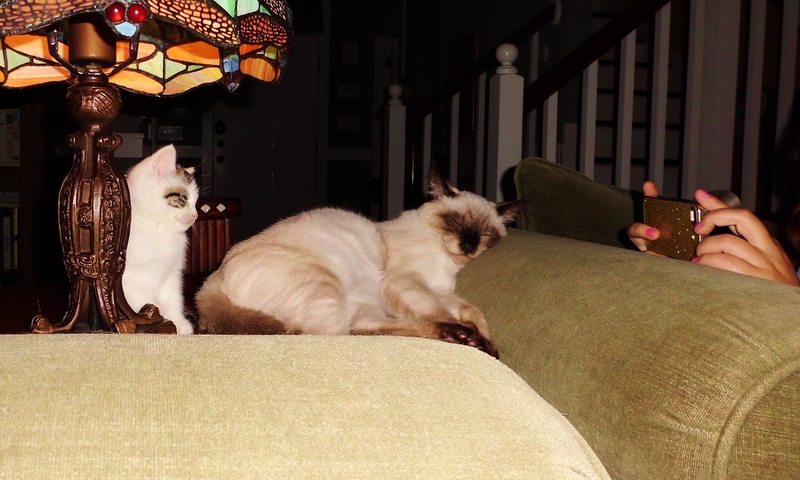 She watched and took pictures with her phone while Bonnie fell asleep standing up near the big white kitty. He looks soft. Wonder if I could use him as a mattress? We’re giving them a regimen of worm medicine and teaching them about how to live in a house and be charming pets. I doubt these hooligans will be here long. They have a healthy appetite and will likely reach two pounds in a week to ten days. I had decided NOT to foster any more babies until Miss Missy crossed the Rainbow Bridge, but the old girl doesn’t seem to mind them at all. They pay little attention to her and they share her food and water bowl. 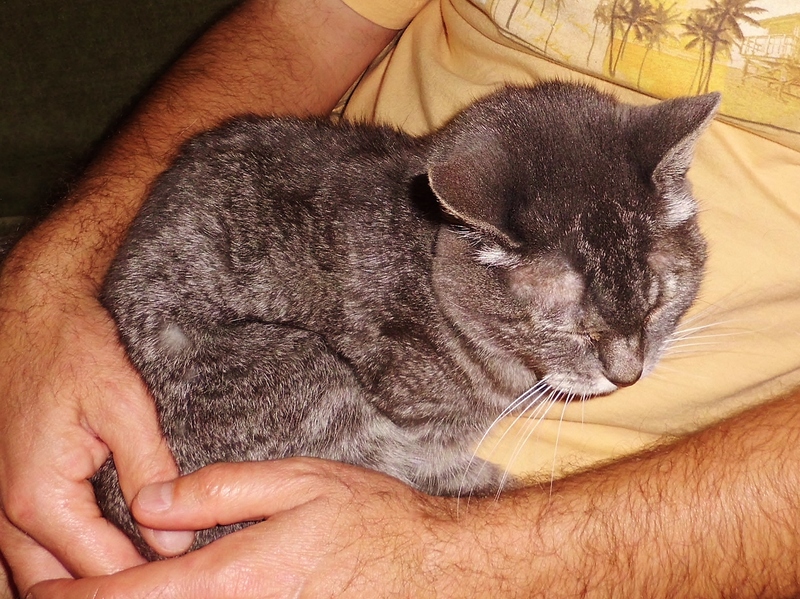 Missy has decided to use her litter box on a few occasions and last night, to our astonishment, she ventured into the living room to get some Daddy love.